Note in the figure, which depicts an intermediate die state, the crumbling or “disintegration” of the die around the eagle and “STATES OF AMERICA”. After looking for these coins for more than 4 years I think, with enough patience, it is possible for the interested collector to put together a die progression of this reverse die if one is not too picky about the condition and grade of the coins. Such a progression would begin with early die states that show no abnormal wear or deterioration and proceed through intermediate die states that show the beginning of the deterioration around the eagle and legend, concluding with very late die states in which there appears to be nearly as much metal in the “halo” around the eagle as there is making up the eagle itself. The 1855-S quarter is a numismatically important issue for several reasons: 1) it is the first quarter struck at the San Francisco mint; 2) it is quite probably the first silver coin of any denomination struck at the San Francisco mint; and 3) it is the only no motto, with arrows quarter struck at the San Francisco mint. 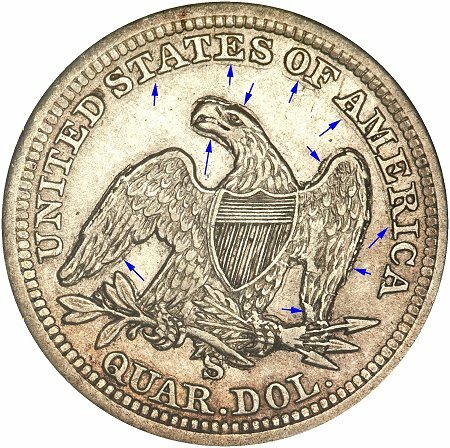 It is also interesting to note that the single branch mint proof was struck from the same die pair (Briggs 1-A) as the coins discussed here. Apparently, reverse die A was the first die used at the new mint and was used until it quite literally disintegrated.